Does Mankind Have To Deprive Itself Of Food To Live Longer And Healthier? Maybe Not. A large question looms for longevity seekers. Is there anything short of a calorie-restricted diet that has conclusively been shown to produce longevity? That question can’t be practically answered in humans because a decades-long study would have to be conducted. For background, a limited-calorie diet, in human terms about one meal a day, has been shown to nearly double the lifespan of most living organisms ranging from fruit flies, roundworms and mice, and there is promising data on monkeys now. But obviously, the Calorie Restriction Society has only a few hundred gaunt-looking members. Food deprivation is not going to be a popular way of living longer. The pursuit of a molecular mimic of calorie restriction has been fervent. Three molecules have risen to the drawing board stage: rapamycin, an anti-fungal/antibiotic drug; metformin, an anti-diabetic drug; and resveratrol, a red wine molecule. The idea is to find a small molecule that would enter cellular machinery and tickle the same genes as a calorie-restricted diet. But in mouse studies, small molecules have not even approached a doubling of the lifespan of mice as produced by calorie restriction. In one laboratory study, rapamycin increased median survival in mice by 10% in males and 18% in females but mega-dose resveratrol had no effect. Mega-dose metformin also did not demonstrate ability to significantly increase the overall or maximum lifespan of mice. Another study did show that metformin increased mean life span by 37.8%, but a huge dose (100 milligrams per kilogram of body weight, or 7000 mg for a 160-lb human) was required to produce this effect. Mega-dose resveratrol did modestly extend the lifespan of overfed mice (60% fat-calorie diet), but slightly shortened the lifespan of mice fed a standard-calorie diet (25% fat calorie). So has anti-aging science driven itself to a dead end? Maybe not. 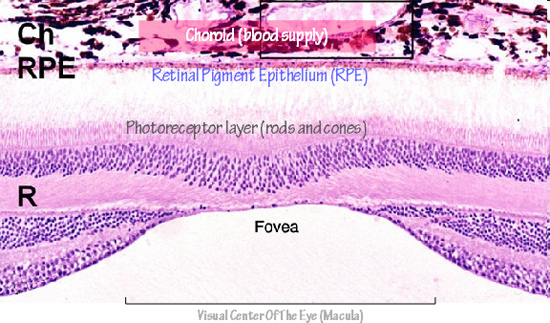 I was reading an overlooked report published in 1993 where mice were given three different diets to determine their effect upon aging of the retina, more specifically a layer of the retina called the retinal pigment epithelium (RPE), which is a single layer of cells that resides between the light receptor cells (rods and cone photoreceptors) and the blood supply (choroid). The photoreceptors shed billions of discs of fatty material (vitamin A, DHA omega-3) every day in their renewal process and the RPE cells digest this material, thus cleansing the retina. If the RPE cannot keep pace with the volume of material it must digest, vision will surely deteriorate. If this occurs in the night vision cells (rods) early in life, it is known as night blindness (retinitis pigmentosa). If it occurs in both rods and cones, as it commonly does in late life of older adult humans, it is called macular degeneration. The cellular debris that accumulates over time in the RPE cell layer is called lipofuscin, which also accumulates in other tissues of the body as it ages. Lipofuscin, which generates free radicals and can result in genetic damage, is a well accepted marker of aging in human tissues. So let’s get back to the laboratory experiment where the animals were given three different diets. 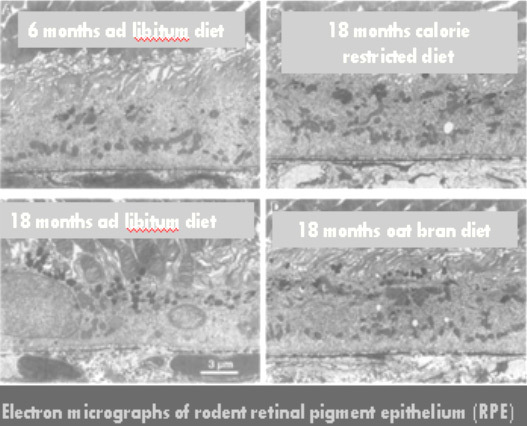 The first group of laboratory mice were fed a “eat as much as you want” (ad libitum) diet for 6 months and 18 months, and accumulation of lipofuscin in the RPE cell layer of the retina was measured. There were obviously more lipofuscin granules in the RPE cell layer of the older animals. And, predictably, there were far fewer lipofuscin granules in the mice fed a limited (-40%) calorie diet. 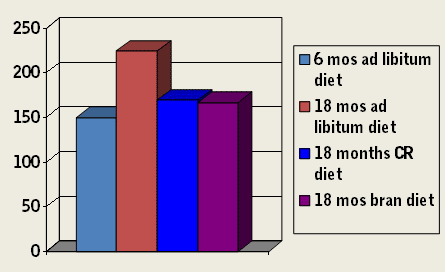 In the third diet, the mice were fed a standard calorie diet plus oat bran fiber. The results in this group were striking. The animals fed oat bran experienced a reduction in the accumulation of lipofuscin that was equivalent to that of calorie restriction! What they were saying is that humans may not have to limit the amount of food they eat, they just need to include bran in their diet. This is astonishing. You can access and read the entire study for free here. The key molecule in bran is inositol hexaphosphate (IP6). It is a mineral-controlling molecule that keeps tissues from rusting and calcifying. There is no explanation as to why this study has been ignored by biologists for over 17 years. It is one of the most astonishing experiments ever conducted in anti-aging science. It corroborates with what we already know – that whole-grain diets unquestionably produce health and longevity. But whole grain diets provide variable amounts of bran and IP6. Supplemental IP6, available as a dietary supplement, would theoretically slow or even reverse the accumulation of lipofuscin in tissues throughout the body and could even reverse biological aging! Other mineral-controlling small molecules like resveratrol, quercetin, ferulic acid, would likely produce synergistic health benefits. Not only does this experiment suggest the rate of aging, as defined by the progressive accumulation of lipofuscin, can be slowed, even reversed, it says the loss of sight in the latter years of life could be averted. Source: Katz ML, White HA, Gao CL, Roth GS, Knapka JJ, Ingram DK. Mason Institute of Ophthalmology, Columbia, MO. Dietary restriction slows age pigment accumulation in the retinal pigment epithelium. Investigative Ophthalmology Visual Science. 1993 Nov; 34(12):3297-302.